Sometimes, our utterances or sentences convey meanings that are totally different from our original thoughts due to our inappropriate use of words. This is always the case when we are to choose between two words that are morphologically identical but semantically different. Examples of such words are "a few and few" and "a little and little". These words might look alike on the surface but do not carry the same meaning hence we should apply ultimate carefulness when using them. 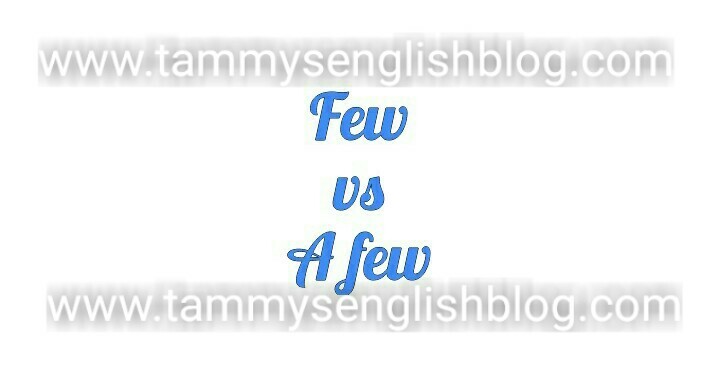 Few, a few, little and a little are quantifiers. They tell the quantity of the nouns that follow them. In order not to deviate from the thematic preoccupation of this article, only "a few" and "few" will be discussed. Both "a few" and "few" mean small quantity, and are generally used with countable nouns. In English, countable nouns are nouns that can take plural markers; e.g., chair/chairs; man/men; lady/ladies; church/churches etc. So, you can say "few books", "a few men", "few chairs" etc. However, “few” is used when the quantity of the item is so small that it is almost insignificant. In other words, “few” shows that the quantity of the item is small and can't be useful for its purpose. In a nutshell, "few" conveys dissatisfaction and a negative idea. On its part, “a few” refers to a significant number which can be used for a purpose. When a speaker makes use of "a few", he/she tries to show that the item can adequately serve its purpose although the quantity is small. For example, a student who has a small quantity of books can say "I have a few books" if he/she knows that the books are enough for passing his/her exams. "A few" conveys satisfaction and a positive idea. It is also important to state that the nouns or verbs that follow these words (a few and few) should always be in their plural forms; e.g., a few person, few are called" few persons, a few books, few books etc. 2. A few persons were present. 4. I have a few shirts.